GERMANY: Utility-developer E.on's renewable sales and operating profit both rose nearly 7% in the first quarter despite a decline in the sales prices for its power output. Sales in its renewables division rose from €376 million in Q1 2017 to €401 million a year later, while operating profit (Ebit) increased from €160 million in Q1 2017 to €171 million over the same period. This came despite a decline in the sales price for power output in the renewables segment, E.on stated in its first quarter results for 2018. The rise in sales in the segment was mainly due to contributions from its 228MW Bruenning’s Breeze project in Texas, USA, and from its 306MW Radford’s Run site in Illinois, which both entered operations in December 2017, E.on stated. 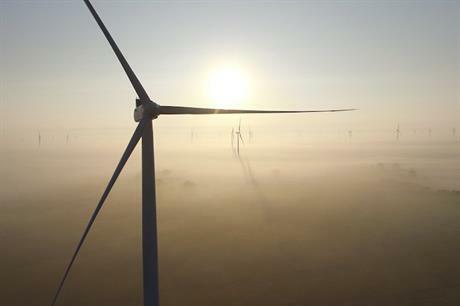 Better wind conditions in the United Kingdom and Italy were also key factors in pushing up renewables sales, the company stated. Meanwhile, the renewables division’s operating profit rose primarily because of the earnings from the 400MW Rampion wind farm off the south-east coast of England, E.on stated. All 116 of Rampion’s turbines are now able to generate electricity, and full operations are due to commence later this year. E.on also installed the offshore transformer station for its 385MW Arkona project in the German North Sea in the first quarter of 2018. It also reached an agreement with RWE for a complex asset swap in March. Under the agreement, E.on will acquire RWE’s 76.8% stake in Innogy – RWE’s renewables, grid and retail unit. In return, RWE will acquire a 16.67% "effective participation" in E.on. E.on added that it expects the operating profit for its renewables division to be above last year’s levels, primarily due to Rampion being fully commissioned later this year. E.on also announced that its climate and renewables division has acquired German developer Vortex. The company has a wind power pipeline of 300MW as well as a "large number of projects" in early stages of development, E.on stated. Vortex’s activities in Poland and Belgium are not part of the acquisition. The transaction is subject to approval by the relevant antitrust authorities, E.on advised. The utility-developer will also enlarge its management board from 1 June as it prepares for the asset swap with Innogy, it stated. Leonard Birnbaum, who is currently responsible for E.on’s network and renewables business, will become chief operating officer of integration. He will be responsible for implementing the transaction and integrating Innogy into E.on, as well as continuing to oversee the company’s renewables business until it is transferred to Innogy. Meanwhile, Thomas König, who currently oversees E.on’s energy networks in Germany, will become chief operating officer for networks. He will be responsible for E.on’s entire network, the company stated. E.on added that it expects the Innogy acquisition to be completed by mid-2019 at the earliest.